Most people like the idea of catching the eyes of others when they find themselves in public places. The clothing you wear, the routine you go through, and the way you style your hair are all statements, with most people wanting to say something positive with the way they look. Of course, though, when it comes to the animal you have with you, it isn’t always quite so easy to achieve the look you want. 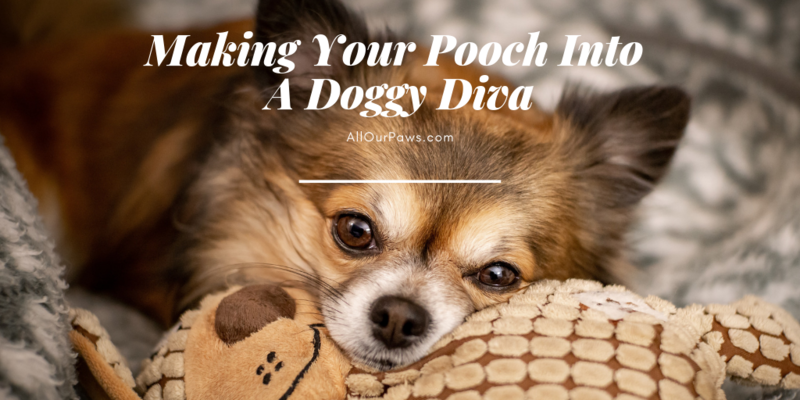 To help you out with this, this post will be exploring some of the best ways to turn your pooch into a doggy diva, all without having to put them through hell in the process. A lot of dogs have fur which will grow constantly through winter, only stopping to shed when the weather starts to get warmer. When they have been growing for a good few months, though, a lot of long-haired dogs will start to look messy. Taking your canine friend to a professional dog barber will cost a little bit of money, but will make them look far better, without forcing them to wear things which will make them uncomfortable. This is great during summer, especially if your dog likes to get messy. Having a collar for your dog is very important. Not only does this give you a safe anchor to attach a leash, but it will also give you a means to identify your dog if they ever get themselves lost. There are loads of collar options which look great while also keeping your furry friend nice and comfortable, but it’s always worth giving your pooch the chance to try them on before you decide on which one they will use. Clothing for pets has been becoming increasingly popular over the last few years, with companies figuring out loads of different ways to dress a dog. Unfortunately, though, a lot of these outfits are uncomfortable for the dog, and this makes it unfair to make them wear them. Instead, if you want to dress your dog, it’s always best to go for smaller garments, like neckerchiefs or t-shirts. It should be easy to tell whether or not they are happy. Like humans, animals like dogs rely on sleep to provide them with a lot of their body’s functions. Without enough of the stuff, most dogs will quickly start to look unhealthy, especially when they are getting older. To combat this, there are loads of companies out there making beds for little dogs and big pooches alike, making it very easy to find a good place for your furry friend to relax. Of course, they won’t need anything quite as fancy as you, but it is worth thinking about this area before you adopt a dog. With all of this in mind, you should be feeling ready to get started on keeping your doggy diva nice and happy. A lot of people struggle with this sort of work, finding it hard to know how to make their pooch look good without making them upset. NextWhat’s the Most Popular Dog Breed in Your State?